Here is the overall league table for the Forest Sprint Series after 5 events. Positions are based on best 4 out of 6 events. 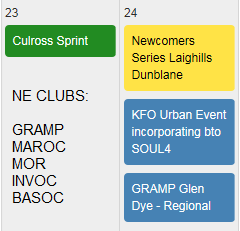 One more event to go: Bellwood, Aboyne, this Wednesday. Still a lot of scope for positions to change. Thanks to Helen Rowlands for helping clear up, and Bob Daly for collecting the controls. 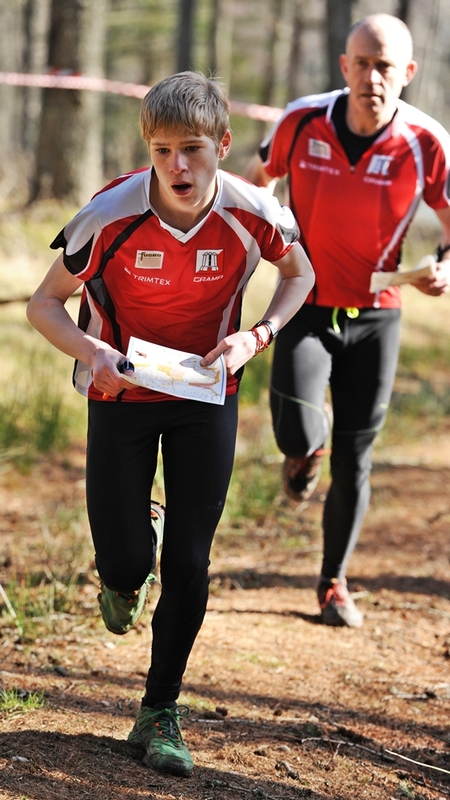 The first of the Forest Sprint Series will be at Foggieton, Wednesday 11th April. Car parking and registration at Cults Primary School. Registtration 18.00 – 18.50, will probably be ready a bit earlier. One course which should be suitable for everyone, 2.7 km, TD3 (ish). No road crossings. The forest is nice and runnable at this time of year; most of the undergrowth flattened after the winter, and no nettles! The Compass Sport Cup qualifying round this year is being hosted by FVO at Beecraigs Country Park, near Linlithgow, on Sunday 11th March as part of their Stepping Into Spring weekend. A newly updated and extended map will be in use. The Scottish Sprint Championships will be at Stirling University on Saturday 10th March. More information about both events here and enter here before 1st Mar. This is an inter-club competition; however, you need to do your own entry via Oentries. You can enter any course you like, but if you want your result to count towards GRAMP score in the club competition then you need to enter an appropriate course. Full details can be found by clicking here. Start times need to be allocated by the club, not the organisers, so if you enter, please let me know (GRAMP treasurer email) if you have a start time preference (early, mid-, late etc). Start times are between 10.30 and 13.00. The finals are on 21st October 2018 at Cannock Chase. A sunny warm evening with a swimming opportunity in the hefalump trap taken by a few including myself and Ian while setting out the controls. High bracken and overgrown paths made it especially challenging for those taking ‘short cuts’. A friendly family all the way from OLG Chur (Chur orienteering club) in Switzerland came and competed as well. I hope they weren’t too underwhelmed. A pleasant cool and dry evening. A bit difficult to squeeze a 3 km course into such a small area. Thanks to Helen Rowlands for helping with registration/download, Dennis, Bob and John for collecting controls and Rob Hickling for help with map corrections. The Compass Sport Cup qualifying round this year is being hosted by KFO at Tentsmuir in Fife on Sunday 12th March. Tentsmuir is a runnable coastal forest, excellent orienteering terrain, which has staged the British Championships in the past! Start times need to be allocated by the club, not the organisers, so if you enter, please let me know (GRAMP treasurer email) if you have a start time preference (early, mid-, late etc). Start times are between 11.00 and 13.00. The finals are on 22 October 2017 in Devon. Pouring rain, even at times so torrential it drove some competitors to give up. Underfoot was slippery and soaking woodrush; hardly idyllic. Well done to everybody and thanks for coming out and giving it a go. Special thanks to the helpers Anne and Rob Hickling who braved the weather and midges to go out again to collect controls, and especially to Willie Nicolson who ran all the way back to the farthest controls on the other side of the dreaded ravine. Here are simple results from the Back o’ Bennachie Summer Series event. Well done to everyone who survived the tropical downpour, midges and wall of dripping woodrush. 15/8/2016 – Updated results after checking splits (apologies for delay – holidays and computer problems). This is an area only used once before so come and explore. Interesting paths, open woodland, flowing burns. Quite a lot of woodrush but all courses except the long technical have route choices that can take you round most of it if you don’t mind the long way sometimes. The long tech is quite physical with a steep ravine along the way. Choose your route carefully. Quite a few new log stacks. Parents warn your children to STAY OFF. There is a very short walk through the car park to the start. Be careful, especially of parking cars. We should be ready before 6.00pm. The Compass Sport Cup qualifying round this year is being hosted by FVO on a new map of Dumyat on the outskirts of Stirling. It will be a high quality Level B event. This is an inter-club competition; however, you need to do your own entry. One club out of ESOC, FVO, GRAMP, INVOC, MAROC will qualify for the finals on Sunday 16 October at Tankersley organised by SYO. You can enter any course you like, but if you want your result to count towards GRAMP score in the club competition then you need to enter an appropriate course. Start times need to be allocated by the club, not the organisers, so if you enter, please let me know (GRAMP treasurer email) if you have a start time preference (early, mid-, late etc). At this stage I don’t know what start times will be available. Let me know if you need advice on which course to enter. A bright winter’s day in Tyrebagger, with a dusting of snow on the ground but not enough to get in the way, even on the open hillside. Those who started late were caught in a short but sharp snowstorm, which made the wood very dark all of a sudden! (making it difficult to read the map for old eyes like mine). Thanks to all the helpers. Those in the tent enjoyed a micro-climate which was a few degrees warmer than outside! For once at Tyrebagger, we found a place to put the tent which caught the sun. results: Click for the event results and split times . Routegadget is loaded – please enter your routes online. Check out your fastest splits and time loss errors at Winsplits here. Just over 30 GRAMP members enjoyed a beautiful sunny day at Balnagowan on Sunday. In the club competition the result was close but GRAMP came 3rd, just behind much larger teams from FVO and ESOC. Special mention should be made of Jonathan Smith, who inadvertently entered the Brown course. When he suggested changing to a more amenable course had his arm gently twisted to stick with Brown in the interests of ensuring a full complement of GRAMP entries. He completed the course and gained 92 points for GRAMP.